Rich Stompanato, president of ARDS Services, Inc., received the Small Business of the Year Award in the Business-to-Business category from the Naperville Area Chamber of Commerce. 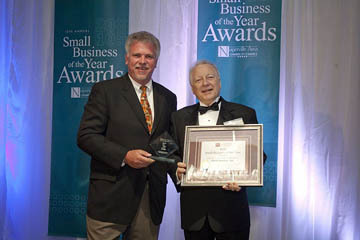 As he accepted the award, Stompanato told the other attendees, "It is by your never-ceasing examples of how you conduct ethical and fair business dealings, your best business practices conducted while constantly helping our community with strong leadership, and the contributions you give that make Naperville the awesome community it is. ARDS Services has strived to follow your model. Doing so made the company an award-winner this evening." According to John Schmitt, president and CEO of the Naperville Chamber, "ARDS is an example of the type of company the Chamber should honor. Rich has been very active in the Chamber, giving his time and talents, serving on many committees, networking with members, creating relationships, and turning those into business opportunities. Rich is also very giving within the community." Schmitt noted the business owner's involvement with School District 203's Computer Redeployment Program which earned Stompanato and team partner Sun Kwok an Award of Excellence from the Illinois State Board of Education and the Schools Partnership Award from Johns Hopkins University last year. Stompanato also serves on the boards of directors of the Naperville Area Chamber of Commerce and the Naperville Area Humane Society. He has devoted countless hours to nonprofits, such as Loaves and Fishes, helping them set up and manage computer systems within their organizations. ARDS Services offers a complete range of technology solutions for business clients and residential customers, ranging from minor computer repairs and upgrades to complete business system installations and IT consulting. To learn more about the company, which is located in Naperville, please visit www.ardsservices.com or call 630-527-6132. Reprinted from Naperville Area Chamber of Commerce Member News, dated 6/4/10.